Give the gift of surprise this holiday season with L.O.L. Surprise! Out of all the collectable products out there, L.O.L. Surprise! has to be one of Bella’s top 2 favourites! She has SO MANY L.O.L. Surprise! toys we have had to buy their own toy box just to keep them all organized. There is no doubt that Bella loves to uncover the surprises and the toys provide hours of entertainment. If you are looking for a great gift idea this holiday season, any of the L.O.L. Surprise products make perfect gifts! 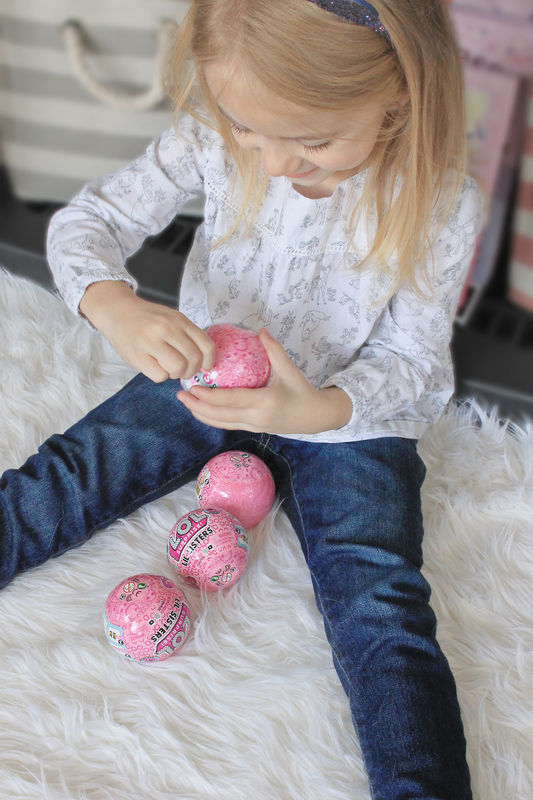 This is the third post for the MGA Entertainment Fall/Winter Toy Box Program. So, normally I do individual review + giveaway posts, but this year I am changing it up. I will still be doing four individual review posts, however, I will be doing ONE BIG GIVEAWAY for a $500 prize pack! The giveaway widget will be at the end of each review post, so you can enter to win on any of the posts, but look for BONUS entries added to the widget with each new post for commenting on that new post. L.O.L. Surprise! dolls were on a TOP SECRET mission when their pet went missing. Find surprise clues across the Eye Spy Series to help find their pet. Unbox 5 surprises with each L.O.L. Surprise! Eye Spy Series Lil Sisters dolls. Use the spyglass to find codes and unlock surprises. Dunk L.O.L. Surprise! Lil Sisters in cold water to discover a colour-change surprise. Mix & match accessories with your L.O.L. Surprise! doll for tons of fashionable combos! 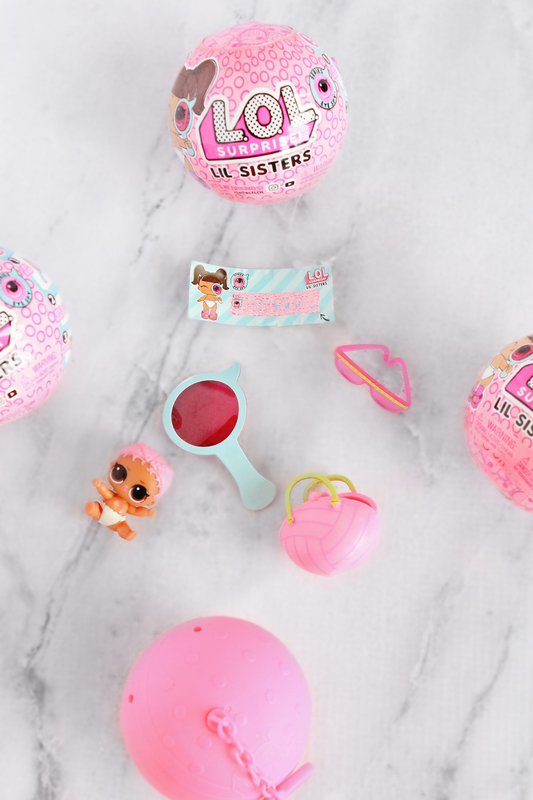 The ball becomes a keychain, carrying case and bath playset! Just like the Eye Spy Lil Sisters, Under Wraps dolls were on a TOP SECRET mission too when their pet went missing. Find surprise clues inside to help find their pets. L.O.L. Surprise! 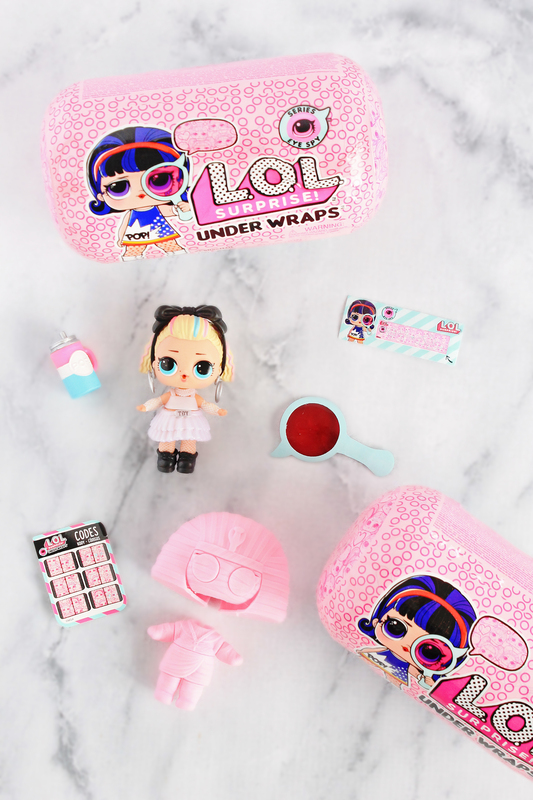 Eye Spy Series UnderWraps dolls have 15 new surprises. Unbox the spyglass to find codes and unlock surprises. Each doll is dressed in a mystery disguise, unbox each layer to discover who’s inside. The disguise becomes multiple fashion accessories. You can also feed or bathe your LOL Surprise doll to discover water surprises. Mix & match outfits for tons of new looks! L.O.L. Surprise! Eye Spy Underwaps Doll. The capsule everything comes in becomes a purse carrying case and doll stand. L.O.L Surprise! Interactive Live Surprise Pets are just like real pets! With over 60 sounds and responses, you can care for your Interactive Live Surprise just like a real pet! Interactive Live Surprise responds to your touch and sounds! Pet, feed, rock and lay down your pet for a different response each time! Your Interactive Live Surprise will even blush! 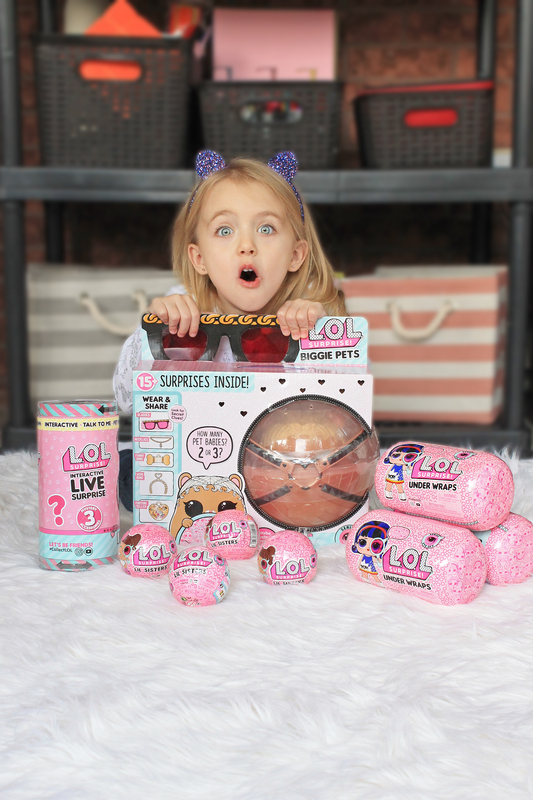 Each Interactive Live Surprise includes a pet and 3 interactive accessories. Bella is totally obsessed with her L.O.L. Surprise! Interactive Live Surprise Pet! Unbox 15+ surprises with L.O.L. Surprise! Biggie Pets! Will you get 2 or 3 babies? Or maybe food babies? It’s a surprise! L.O.L. Surprise! 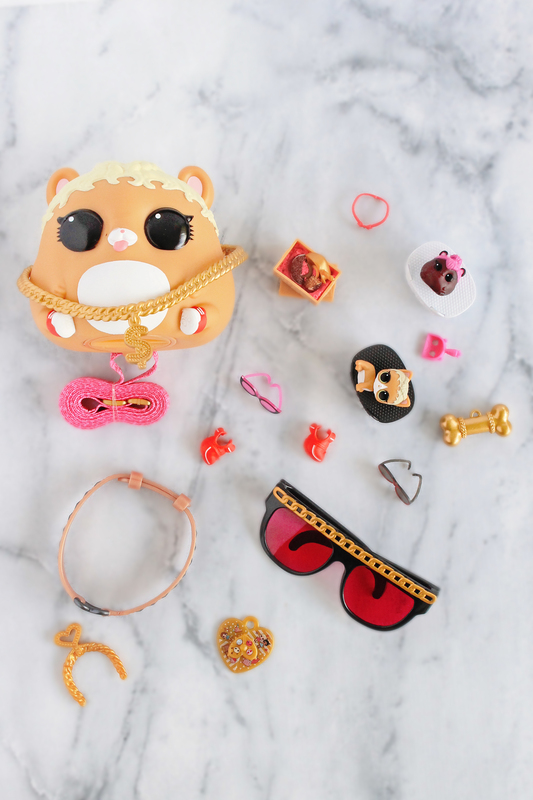 Biggie Pets have tons of surprises inside and include wear-and-share accessories for you! Use the Eye Spy Series spy glasses to find codes and unlock surprises! L.O.L. Surprise! Biggie Pets M.C. Hammy comes with 15+ surprises inside! Wear & share accessories: Spy glasses and her necklace becomes a necklace for you! 1 Wish Bone, 1 Funny Bone, 1 Fortune Teller Heart, 1 Baby Reveal. Bella loves her L.O.L. Surprise! Biggie Pets M.C Hammy and is using her as a piggy bank! You can find a wide variety of L.O.L Surprise! toys on Amazon.ca in Canada. Find L.O.L Surprise! toys on Amazon.com in the US. MGA Entertainment has generously sponsored an amazing $500 giveaway for my audience – THAT’S YOU! This is the third post in my Holiday Giveaway Series, so I will only be telling you what L.O.L Surprise! products have been added to the holiday toy prize pack. If you have already entered the giveaway on the previous Poopsie Surprise or Who’s That Girl posts, check the giveaway widget below for a NEW BONUS ENTRY OPTION (BONUS #2) to gain more entries into the giveaway! Stay tuned for the final review post to find out what the last and biggest prize will be! This giveaway is open to Canadian residents who have reached the age of majority in their province. This giveaway will close on December 6, 2018, at 11:59 PM EST. A winner will be drawn from all eligible entries and contacted via email on December 7, 2018. The winner will have 24 hours to respond to the email and claim their prize. Disclosure: Although we were sent product for review consideration, the opinions and language are all my own, and in no way do they reflect MGA Entertainment. Any product claim, statistic, quote or other representation about a product or service should be verified with the manufacturer, company, provider or party in question. Thank you for the chance to win! My daughter is obsessed with these and would love to have them! im super grateful for this opportunity. THAnk you! So awesome!!! My daughter would lose her mind for these!!! This is what my little sister wants for Christmas!!!! She’s obsessed with this! My daughter loves lols ibdo to they’re super cute. I collected polly pockets as a kid. This is what my little sister wants for Christmas!!! She’s obsessed with these!! Thanks for the opportunity! I loved to collect beanie babies! I still have my collection after all these years! I’m not sure if I had any collections when I was younger. But polly pockets was among one of my faves ! I love to collect Nancy Drew novels as a child. I used to collect POGS, marbles, my little pony and trolls hahah. Some things are comin full circle! I want a hippopotamus for Christmas is my favorite Christmas carol. My niece has only LOL Surprise dolls on her Christmas list. She loves these so much. I collected rocks…well i still do. My daughter would love this!! 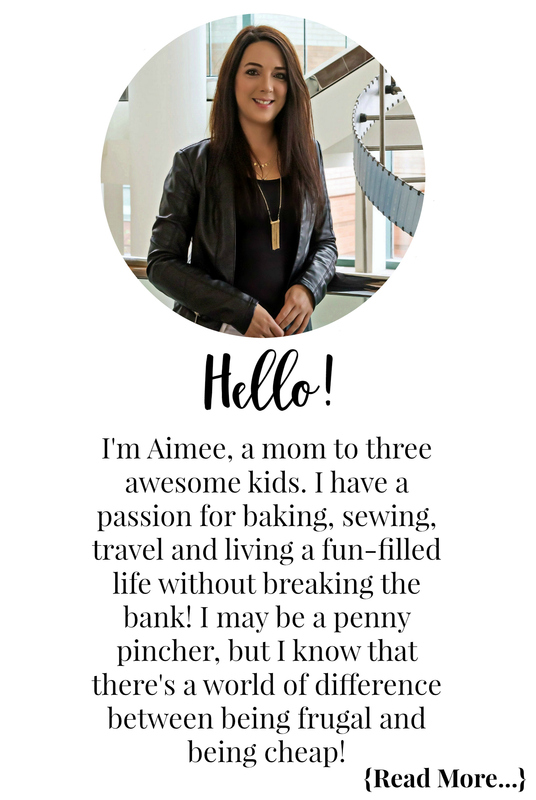 But would she share with my twins lol??! I used to love my Cabbage Patch kids! I love Frosty the Snowman! Bella is one lucky little girl!! I love the look in her eyes with all these openings! My granddaughters would love this, they love anything they have to open to find out what is inside! thank you so much for these awesome giveaways!! Both of my kids boy 6 and girl 11 want these for christmas. I had an obession with smurfs that came in Kinder eggs for a while! Collected them all!! I collected rocks as a kid! I loved going to nature museums to see what new ones I could find! My favourite Christmas Carol would have to be Santa Baby! Tough Question, I do have many more! I used to collect pogs!! I collected strawberry short cake dolls. When I was little I use to have quite the collection of Kinder Surprise toys. I used to collect My Little Ponies (I still have them! ), stickers (I completed the entire She-ra book – still have it too! ), pins and Strawberry Shortcake minis. My girls are crazy for Lol’s we play with them all the time! Our favourite Christmas song is All I want for Christmas is You, Mariah Carey. My favourite xmas Carol is Frosty the Snowman! I loved cabbagr patch kids and barbie! When I was a kid I would collect rocks..lots of pretty rocks..lots..and still do! I loved the little Polly Pocket toys when I was a child. When I was about 14, I used to take stray kittens off the road and take care of them giving milk and food. My daughter would love this. I collected Cabbage Patch dolls when I was younger. My favourite Christmas carol is Deck the Halls. I collected Pogs and marbles when I was a kid ! I used to collect frogs.. When I was a kid I used to collect bottle caps! I collected Barbies when I was younger. I loved to collect Kinder Surprise toys as a kid! I loved to collect Barbies and Polly Pockets when I was a child! I loved to collect barbies and chapsticks! I lived this collect badges! Wow autocorrect and typing before coffee! I used to collect keychains & Disney beanie babies. I collected these little doll from different countries. My parents, aunt, uncle would always bring me on from their holidays! As a kid I had a collection of sweet valley twins books! My daughter has her own collection now, but hers is LOL dolls! I collected marbles as a child. My favorite Christmas song is Rudolph!! I collected stickers to trade with my friends and everything Barbie, just had to have all the accessories that Barbie had! I collected baseball cards and pogs ! I loved collecting Trolls when I was young! I loved collection dolphin figures and polly pockets when I was younger. Growing up I collected Bobbsey Twin books and erasers. I loved collecting My Little Pony, stickers and erasers when I saw younger. I loved to collect Polly Pockets! Growing up, I had quite a number of collections: stickers, shells, postcards, stuffed animals, stones, cute erasers, Archie comics, animal miniatures and Barbies. I was obsessed with dogs and unicorns. I had a whole shelving unit filled with little plastic, or ceramic, dogs and unicorns. Oh and Ty beanie babies of course! Oh man I used to collect so many things lol but I loved troll dolls, pogs, cabbage patch dolls..
As a kid a collected pogs, marbles, and TY beanie babies ! Erasers and Garbage Pail Kid Stickers (came in a pack with a piece of gum) also collected the household product ones that they gave funny names to (don’t recall what they were called). I used to collect pencils and stickers! My favourite thing to collect as a child was stickers – I LOVED my sticker album and loved trading with all the neighbourhood kids and my friends. This is definitely something my daughter would enjoy! I remember collecting Pogs and Barbies as a kid.